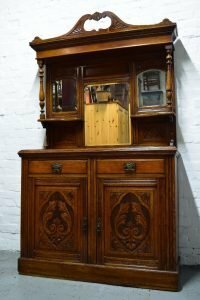 A tall standing heavily carved solid wood side dresser, inlaid to the back with mirrors, having two small drawers above a double cupboard. 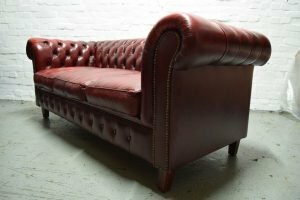 A vintage three seater Chesterfield sofa on solid wood legs, upholstered in ox blood authentic leather with brass studded detailing. 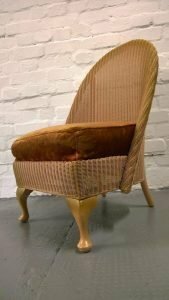 A vintage high back hall chair on solid pine legs, upholstered to the seat in mustard yellow velour. 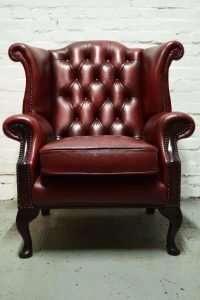 A vintage wing back Chesterfield armchair on solid wood legs, upholstered in ox blood authentic leather. 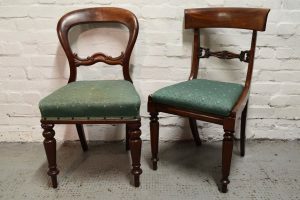 A pair of solid wood carved high back hall chairs, upholstered to the seats in cream damask fabric. 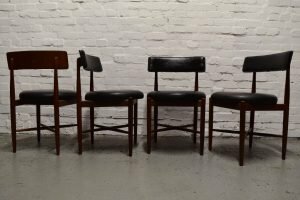 A set of four retro curved back dining chairs on a solid mahogany base, upholstered to the seats and backrests in authentic black leather. 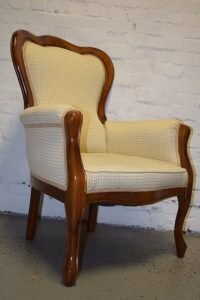 A vintage high back armchair on a solid wood base, upholstered in cream polka dot patterned fabric. 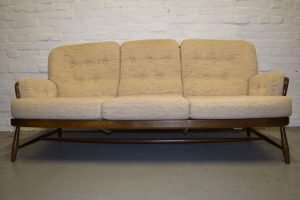 A large three seater high back sofa on a solid wood base, upholstered in stone cotton fabric. 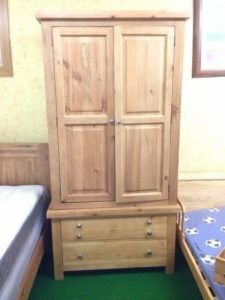 A tall standing mexican pine double wardrobe, having two doors above two small and one large drawer. 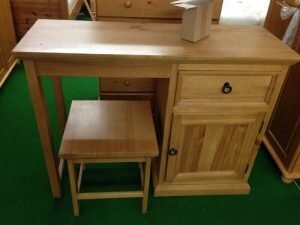 A solid pine dressing table and matching square stool, having one drawer above a small cupboard. 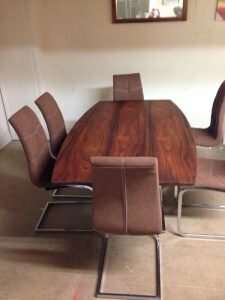 A solid wood retro dining table on a chrome base, together with six high back dining chairs, upholstered in chocolate brown suede. 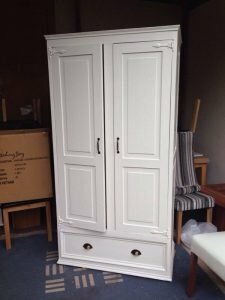 A hand painted white solid wood double wardrobe in the shabby chic style, having one large drawer to the bottom. 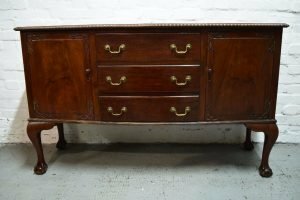 A large vintage heavily carved mahogany sideboard on lion paw feet, having a cupboard to either side of three central drawers. 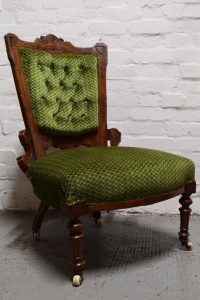 A vintage heavily carved solid oak high back hall chair on castors, upholstered to the seat and backrest in patterned green velour. 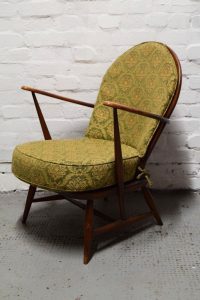 A vintage high back reclining armchair on a solid wood base, upholstered in green damask patterned satin. 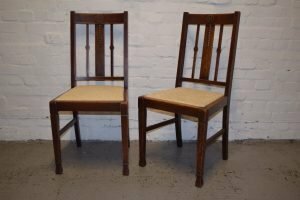 A near pair of vintage solid oak high back hall chairs, upholstered to the seats in green patented fabric. 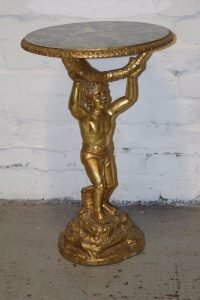 A vintage heavily carved figural gold painted side table in the art nouveau style, having a circular marble top. 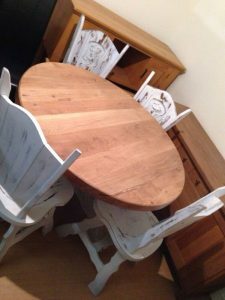 A solid wood circular dining table, together with four high back heavily carved dining chairs, hand painted in white. 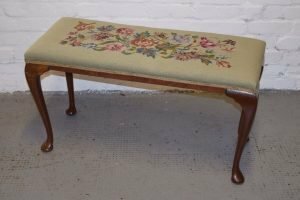 A vintage double hall bench on a solid wood base, upholstered to the seat in floral embroidered fabric. 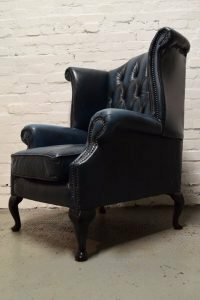 A vintage wing back Chesterfield armchair on mahogany legs, upholstered in dark blue authentic leather.